We’re excited to be taking part in the A to Z of STEM series hosted at Little Bins for Little Hands. If you’re not familiar with STEM this stands for Science Technology Engineering and Maths, so the series will be covering all sorts of fun educational ideas fitting into these categories. Mr Z, like his Dad, has a keen interest in Maths so we’ve chosen to go for a Maths topic for the letter A and will be sharing an Angles project here today. 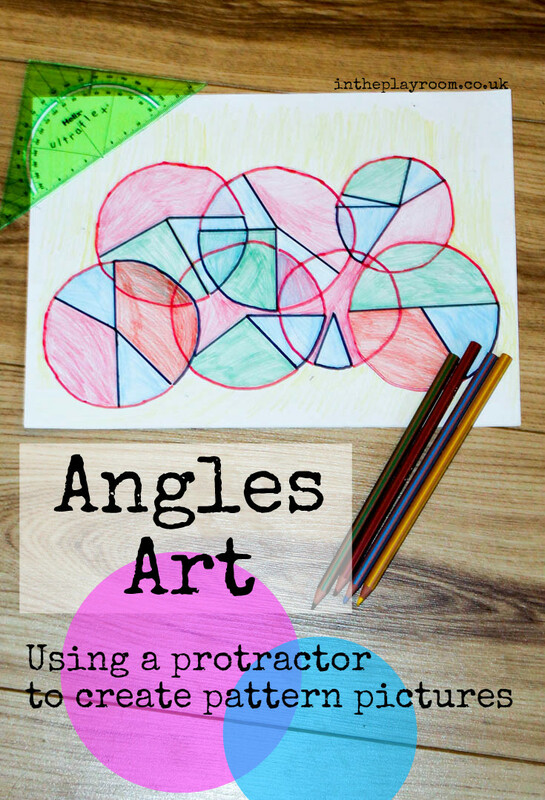 We have been exploring using protractors, measuring and talking about angles and also using angles to create some fun and colourful Angles Art. We’ve been learning and talking about angles at home for a while, introducing the concept by starting with a circle having 360 degrees and then slicing into 180 and 90 degree angles. If your child already has a grasp on Fractions, then that should really help with understanding angles. 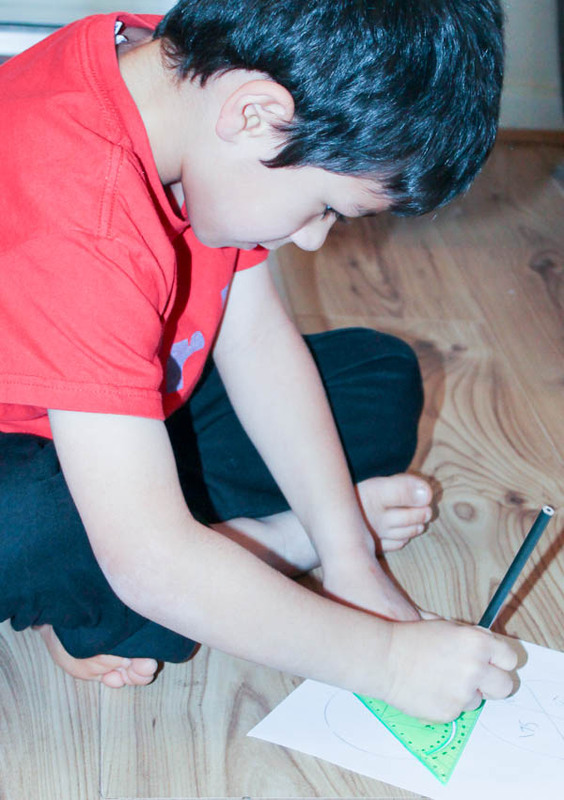 If they already know about angles and understand most of the basic concepts then you could go straight into introducing the protractor as a tool for art and see what ideas your child can come up with independently, or together. Before starting out on our angles artwork, we took some time to play around with the protractor drawing some angles into our circles, and measuring what we had drawn. 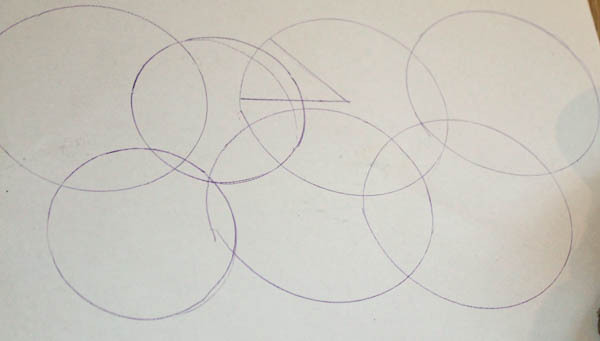 A compass is a really good tool to use alongside the protractor for maths based art too, to explore how the distance between the pencil and the compass results in different sized circles. You can explore this together with the protractor to look at how angles in a circle are the same regardless of the size of the circle, and to talk about proportionality being more important than the actual size. 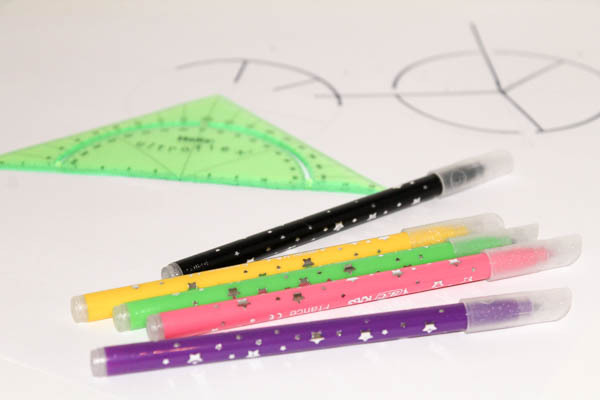 It’s fun for children to have these maths tools and the time to explore them in their own time, and make observations about the shapes, marks and measurements they make with them regardless of whether the result comes out looking like artwork or not. But for this project, we did want to create something artistic that was based off all the angles we had been learning about and I think the results look pretty cool. 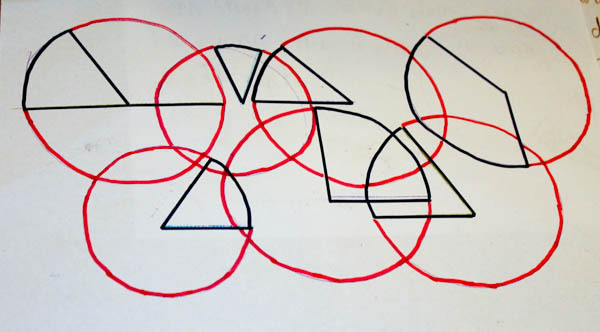 We started by sketching out some circles and then measuring an angle or to within each circle, letting the circles overlap. Once you start to outline this in a bold black marker or felt tip, you can see the basis of an abstract artwork starting to form. We decided to stick to a colour scheme where we coloured acute (under 90 degrees) and obtuse (between 90 and 180 degrees) angles differently, and coloured right angles (90 degrees) and perfect 180 degree angles in their own colours too. We didn’t have a colour scheme for reflex angles (over 180) so they have just been coloured as obtuse here but that will be something to introduce next time. This way of colouring is a fun way to get kids to assess what category an angle would belong in by judging the size, they can also get the protractor back out and check their work if they are not sure or just fancy double checking. 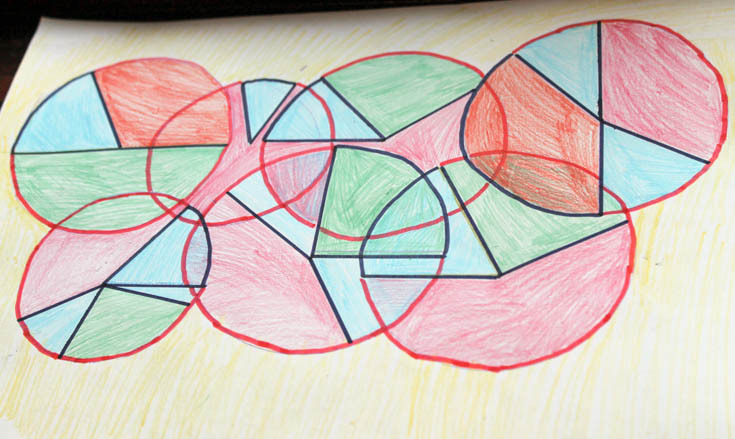 The finished result makes a fun and colourful mathematical piece of art! 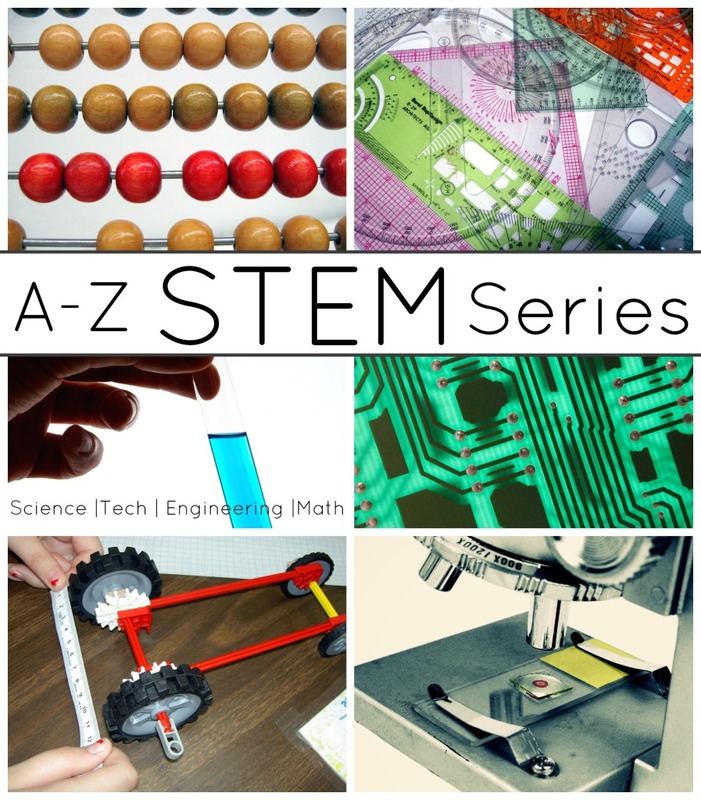 Find out more about the A to Z of Stem series here at Little Bins for Little Hands. 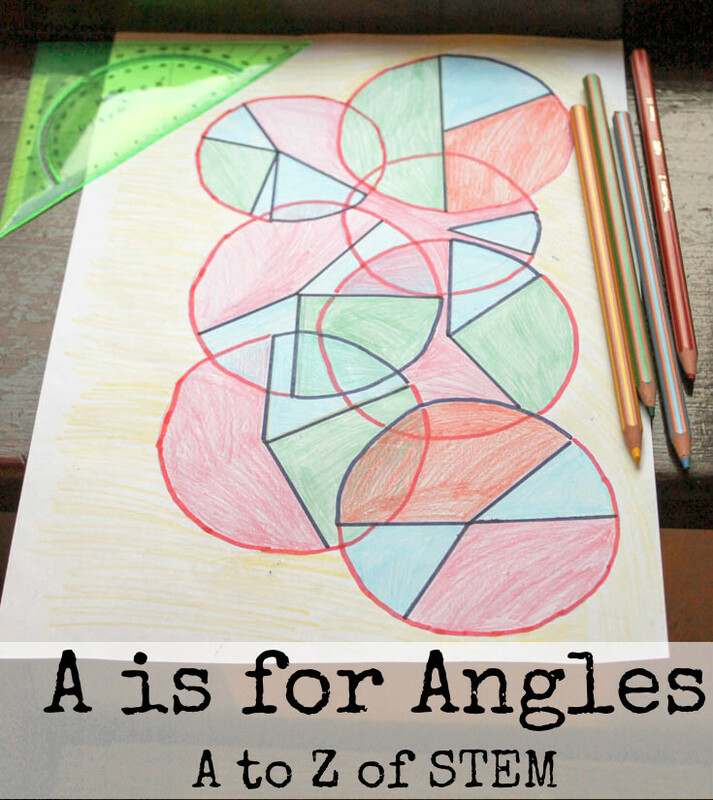 There are multiple ideas per letter (for today A is also for addition, absorption, and active math – just to give you a taster) so this series is going to be a great resource for STEM activities for kids! What a lovely way to “play” with angles! My 8 year old will love to try this out. If only I knew where our protractor was! This is a really interesting find! I think Louis would enjoy this activity – I’ll let you know how we get on!